One of the modeling difficulties with foil bearings is the friction damping in the compliant support structure. This damping is crucial to the operation of foil bearings, but is really not that well understood. Indeed, many researchers/developers working with foil bearings simply assume an effective loss factor based on test data for a typical bearing design. This approach will work for analysis of existing bearings, but provides little guidance for the development of new bearings. This is especially true if a new support structure is being considered. Assuming a loss factor also makes it difficult to analytically optimize an existing support structure (bump foil) configuration. In 2005-2006, Dr. Swanson looked at the basic physics of a single bump with a single friction interface. Using this simplified model and a simple friction model, he evaluated the static and dynamic behavior. He found that this simple model could reproduce many of the trends in experimental observations of bump foil dynamics from the literature. 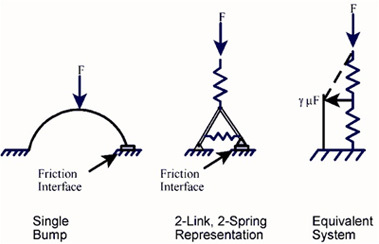 It also highlighted some of the unique features of the bump friction physics relative to simple friction models. Much of this work was published in Bump Foil Damping Using a Simplified Model. This work also included development of a multi-harmonic balance approach that avoids the need for using time integration, resulting in decreased computation times. Some experimental work using larger bump structures to make it easier to see the predicted effects has also been performed (see figure). In general, the test results confirm the predictions from the analytical work. 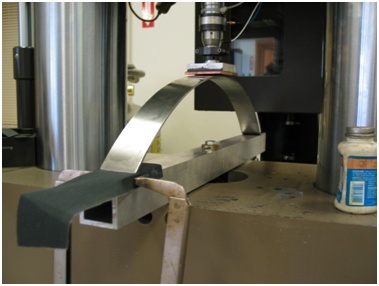 This work has been extended to multi-bump strips, and a more sophisticated friction model has been added. The ultimate goal of this work is to incorporate this analysis approach into the foil bearing code.